PORT-AU-PRINCE - Supreme Court judges fired by Haiti's interim government formed a human chain with their allies on Wednesday to block their replacements from being sworn in, officials said. Four of the five retired judges, court clerks and law students disrupted the ceremony at the Supreme Court joining arms to block the nominees from entering the chambers where the swearing-in was to take place, said Judge Michel Donatien, one of the retired judges. Witnesses said there was a scuffle and that police had to separate protesters from the judges who were going to lead the ceremony. The judges were retired by interim President Boniface Alexandre a day after the Supreme Court published a ruling giving the green light to the presidential candidacy of U.S. multimillionaire Dumarsais Siméus, a ruling seen as a blow to the government. The judges said their removal was unconstitutional. Donatien said the U.S.-backed interim government -- installed after a bloody rebellion ousted former president Jean-Bertrand Aristide in February 2004 -- did not have the right to retire judges because they were not elected to office. ''We are nominated for 10 years each, and it is completely illegal to arbitrarily remove us,'' Donatien said. 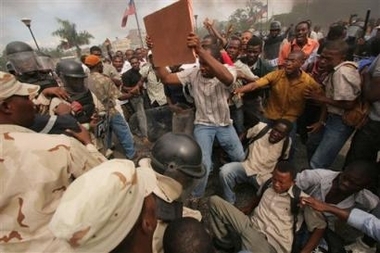 DEC. 13, 2005 - On the streets protesters vented anti-Dominican feelings The Dominican Republic's envoy to Haiti has demanded an apology for clashes that marred a visit to Haiti by Dominican President Leonel Fernandez. Jose Serulle Ramia said the incident was the result of the irresponsibility of the Haitian state. At least three people were hurt in the clashes with police during a rally against the alleged abuse of Haitian migrants in the Dominican Republic. The violence forced Mr Fernandez to cut short his Monday visit. 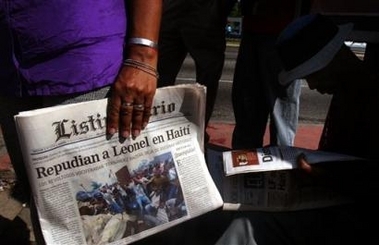 The Haitian government has condemned the violence in the capital, Port-au-Prince, launching an inquiry. Hundreds of protesters greeted Mr Fernandez outside the National Palace, as he was preparing for talks on immigration and border security. The crowd chanted: "Fernandez, racist, stop murdering Haitians,"
Many were also angry at forced evictions and Mr Fernandez's recent description of Haiti as a "danger to the world". The crowd later began throwing rocks and setting tyres alight as Mr Fernandez's motorcade was about to leave the capital. In response, Haitian police fired automatic weapons in the air, attempting to disperse the crowd. During the talks, Mr Fernandez said his country deplored "any act of violence between Dominicans and Haitians". Police in the Dominican Republic had earlier played down reports that at least 10 people were killed in the town of Villa Trina. Violence between immigrants and locals in Villa Trina has flared in the past week after the murder of a Dominican was blamed on Haitian immigrants. About 20 homes occupied by Haitian immigrants were burned in reprisal. Some one million Haitians live in the Dominican Republic. Haiti lies on the west and the Dominican Republic on the east of the Caribbean island of Hispaniola, the two countries sharing a land border. PORT-AU-PRINCE, Haiti, Dec 12 (Reuters) - Several people were injured on Monday when riot police in Haiti clashed with students protesting a visit by the president of neighboring Dominican Republic, witnesses said. The demonstrators, who gathered outside the presidential palace, called Dominican President Leonel Fernandez a criminal and demanded an end to abuse of Haitian migrants. "You are not welcome! Go back home!," chanted the crowd of students, who also burned tires. "The Haitian people cannot welcome Fernandez when Haitians are being killed and treated like animals in the Dominican Republic because of Fernandez's racist policy," said Jean Wilson Junior, a student leader. Human rights groups say Haitians who cross the border to the more affluent Dominican Republic looking for work have been attacked and killed by Dominican mobs and that Dominican authorities condone the behavior. Witnesses said several protesters were injured, including two who were shot. They said police also hit the rock-throwing students with batons. Thousands of Haitians have been arrested, detained or returned to Haiti from the Dominican Republic. The two countries share the Caribbean island of Hispaniola. Fernandez acknowledged Haitians had been the victims of "extremists" and promised his government would do all it could to end the abuses. "We have publicly expressed in the Dominican Republic that we deplore that situation. We have said that in a civilized country only the justice system has the authority to judge and punish crimes that are committed," said Fernandez as he stood next to Haitian President Boniface Alexandre at the palace. BOSTON, Dec. 1, 2005 -- Ten people, including at least three who worked for a major Boston-area bank, were indicted Thursday on charges that they stole bank customers' account information and used it to create and cash counterfeit checks in excess of $1 million. The scheme was allegedly devised in May 2002 by Burdley Jean, 25, of Randolph, whose job at FleetBank, now Bank of America, gave him access to information on how banks encode and process checks, federal prosecutors said. Two other suspects, Jude Celestin, 23, of Boston, and Peterson Dumornay, 25, of Randolph, also worked at Fleet as personal bankers, which gave them access to the bank's database of customer account information, prosecutors said. Jean allegedly used the account information to obtain or create counterfeit checks, which he then used to draw money from those accounts. The scheme allegedly targeted more than 50 people, resulting in a loss of more than $1 million. Jean also allegedly recruited "runners," or people to go to various banks to cash the counterfeit checks for him, authorities said. The suspects were indicted on conspiracy and bank fraud charges. They each face a maximum of five years in prison, three years of probation and a $250,000 fine if convicted of conspiracy; and 30 years in prison, five years of probation and a $1 million fine if convicted of bank fraud. In addition to Jean, Celestin and Dumornay, the others indicted were Jean Noriscat, 30, of Stoughton; Anderson Demosthenes, 27, of Brockton; James Robert Normil, 20, of Cambridge; Steven Marcelin, 27, of Boston; Shavone Noble, 22, of Cambridge; Tyamisha Tavares, 24, of Boston; and Edouard Ducarmel, 27, of Boston. © Copyright 2005 Associated Press. PORT-AU-PRINCE, Haiti, Dec. 9, 2005 (Reuters) - Haiti's interim government fired all five Supreme Court justices on Friday, a day after the court unanimously ruled for the second time a Haitian-born U.S. millionaire could run for president. The justices were fired in an executive order signed by U.S.-backed interim Prime Minister Gerard Latortue and Justice Minister Henri Dorlean. The order did not give a reason for dismissing the justices, several of whom were appointed by ousted former President Jean-Bertrand Aristide. The government, which immediately appointed five new justices, had criticized the court's decision ordering election authorities to put candidate Dumarsais Simeus on the ballot for the January 8 presidential election. Election officials appointed by the interim government had said Simeus was ineligible because he had obtained U.S. citizenship and Haitian law bars foreign nationals from running. Simeus, who runs a Texas food processing company, said he never renounced his Haitian citizenship and the Supreme Court ruled him eligible for the ballot. Ballots for the election have already been printed and Simeus is not among the 35 approved candidates whose names appear. 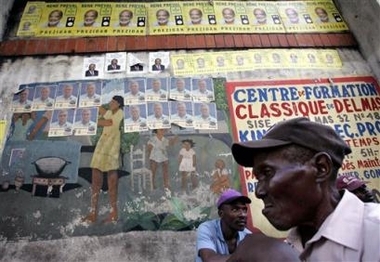 The presidential and legislative elections would be Haiti's first since Aristide was driven into exile in February 2004 during an armed rebellion. A runoff is scheduled for February 15 if no candidate wins on the first round. An opinion poll released on Friday showed former President Rene Preval leading the race with the support of 32 percent of likely voters, followed by Simeus with 21 percent. Their closest pursuer, former President Leslie Manigat, had support from 5 percent of the respondents. Turnout had been strong at demonstrations supporting Preval, who served as prime minister in 1991 during Aristide's first presidential term. The poll was conducted by the Gallup organization and one of its Latin American affiliates, Consultoria Inter-disciplinaria en Desarollo, known as CID, for the U.S. Agency for International Development. The survey of 1,200 likely voters was conducted during the first half of November and was released by the U.S.A.I.D. at its headquarters in Port-au-Prince. The elections had been delayed from November and U.N. peacekeepers are still struggling to establish order in the poor Caribbean nation amid rising gang violence and kidnappings for ransom. PRAGUE/OLOMOUC, Dec. 9, 2005 - Czech missionary Roman Musil was kidnapped from northwest Haiti a few days ago, while the kidnappers are demanding a $50.000 ransom, Martin Sedlon from Musil's order said. The church dignitaries, who are negotiating with him, said that this was not political kidnapping, but a criminal act, Sedlon from the Oblates of Mary Immaculate (OMI) said. Kidnapping is frequent in Haiti. Reuters has written that over 1000 people have been kidnapped there since March. The Czech OMI received the information about the abduction by e-mail. The Haitian head of the OMI immediately started negotiations with the kidnappers and informed the Vatican. Sedlon said that the Czech diplomatic office had been informed as well. "No politics seems to be involved. Kidnapping is commonplace in Haiti. According to my information, some five to six people are abducted there for ransom on the weekly basis," said Sedlon, who considers the situation hopeful. Musil cooperates with the Olomouc-based Agency for Development and Humanitarian Aid. "I have received the information from a colleague of mine who was sent by our agency to Haiti in order to help build a school," Pavel Novacek from the agency said. "Probably on Wednesday, Musil went along with a 15-year boy to the capital to fetch the parcels sent by the Charity from Zabreh or Olomouc. They were allegedly kidnapped shortly before they reached the place," Novacek said. His words were confirmed by Sedlon. "We are considering launching a petition, but we do not want to enter the affair too soon," Novacek said. The agency wanted to send a specialist on tropical diseases to Haiti in January. Now it is reconsidering the decision. PORT-AU-PRINCE, Haiti,.Dec. 8, 2005 (Reuters) - Haiti's Supreme court ruled on Thursday that a Haitian-born U.S millionaire can run for president, confirming a previous order ignored by Haitian interim authorities, lawyers said. Guerdy Lissade, a lawyer for candidate Dumarsais Simeus, said the court issued a unanimous decision allowing his client to run for the presidency. "For the second time, the Supreme Court ordered election authorities to add Simeus' name on the final list of approved candidates," Lissade said. "Now, there is nothing left to do. The electoral council can only comply with the order." The court reiterated that its decision allowing Simeus to run was irrevocable. If the ruling is executed, elections would be unlikely to take place as scheduled on January 8 because presidential ballots have already been printed. Simeus issued a statement calling the court's decision "a victory for the Haitian people, who have suffered for too long under the oppression of the same little group of politicians who perpetuate a failed political system, broken economy and violence in our streets." The presidential and legislative elections would be the first since former President Jean-Bertrand Aristide was driven into exile in February 2004 during an armed revolt. Some three dozen candidates are running for president and a runoff is scheduled for February 15. Election officials appointed by the interim government refused last month to put Simeus on the ballot because he had obtained U.S. citizenship and Haitian law bars foreign nationals from running. 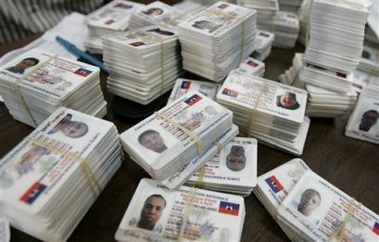 Simeus said he had never renounced his Haitian citizenship and the Supreme Court ruled him eligible for the ballot. The elections had already been delayed from November and U.N. peacekeepers are struggling to establish order in the deeply impoverished nation of 8 million, where gang violence and kidnappings for ransom have been on the rise. PORT-AU-PRINCE, Haiti, Thursday, Dec. 8, 2005. (AP) - The United Nations acknowledged Thursday that its peacekeepers likely opened fire on a car full of Haitian police officers this week, wounding two. According to a preliminary investigation, five uniformed officers were driving toward a U.N. checkpoint on Monday when the peacekeepers opened fire, said U.N. spokesman Damian Onses-Cardona. He showed reporters photographs of the blue car, which had official license plates but no other markings. "The first elements of the investigation tend to show that U.N. peacekeepers could have done the shooting," Onses-Cardona said. Cite Soleil, where gunbattles between peacekeepers and gangs take place almost daily, remains the most insecure place in Haiti ahead of national elections scheduled for Jan. 8. Haitian police do not enter the slum, which a battalion of 1,500 Jordanian peacekeepers in armored vehicles has pledged to reclaim from the gangs. One of the two wounded Haitian police officers remained hospitalized in stable condition Thursday. "Even though this incident is appalling, the tight collaboration between U.N. peacekeepers and Haitian police will continue," Onses-Cardona said. The two forces currently are studying a joint plan to combat kidnappings, which have surged in areas near Cite Soleil, he said. Meanwhile, representatives of Haiti and the European Union Thursday signed an $88 million deal for road-building and repair grants. The aid will go to building about 60 miles of new roads, mainly in Haiti's north and near the neighboring Dominican Republic. Interim Prime Minister Gerard Latortue said he hopes the improvements will help reduce the hundreds of deadly accidents each year on Haiti's crumbling roads. TAMPA, FL, Dec. 5, 2005 - A north Tampa man taking supplies to an orphanage in his native Haiti was kidnapped in its capital city on Saturday, the orphanage co-founder said. Armed men pulled Daniel Thelusmar, 26, out of a van traveling through the streets of Port-au-Prince, a city wracked by poverty and instability. The men also shot and injured the Canadian orphanage director, who was traveling with Thelusmar, said Nelson Ryman, of Zephyrhills, who helped found the orphanage. Thelusmar has a wife and 19-month-old daughter in Tampa. A deeply spiritual man, he has been involved with several evangelical Christian projects, especially in Haiti, Ryman said. The woman who answered the door at Thelusmar's north Tampa apartment Monday afternoon said she did not want to comment. Ryman said the kidnappers have demanded $10,000. Ryman, a retired mobile home park owner and businessman, is traveling to Haiti today to try to help his friends. Orphanage director Ed Hughes had to have his right arm amputated from the elbow as a result of the shooting, Ryman said. Haiti's political and economic stability has plummeted in the past year, with travel there becoming increasingly dangerous. In November, the U.S. Department of State issued a warning for American travelers about the country's "volatile security situation," urging Americans not to visit. The nation's deep poverty makes it hard for missionaries to stay away. "It's really hard to comprehend," Ryman said. "I see starvation every time I go." Ryman recently won a $31,000 grant from Rotary Club International to buy a truck for the orphanage, Tytoo Gardens, in Simonette, a small, poor fishing village north of Port-au-Prince. The orphanage houses 17 children. Every day, 120 to 150 children from the village eat a hot meal there - often their only meal of the day, he said. The truck would help transport the children from the orphanage to school and to church. In Florida, Thelusmar joined with Ryman to bring parts for the new truck to Simonette. Thelusmar arrived in Port-au-Prince on Saturday morning. Hughes, the orphanage director, collected him from the airport. The pair drove through a rough part of the capital city when men surrounded their van. Hughes was shot in the arm. He was left on the side of the road, Ryman said. That's when Thelusmar went missing. Thelusmar's family has received chilling phone calls from the kidnappers. Thelusmar was born in Haiti and came to the United States in his early 20s on a visa sponsored by an American man involved with missionary work in the Caribbean, Ryman said. Although Thelusmar is a legal U.S. resident, he is not an American citizen. The U.S. Department of State is limited in its powers when trying to help non-American citizens in trouble abroad, a department spokeswoman said. PORT-AU-PRINCE, Haiti, Dec. 2, 2005 (Reuters) - Kidnappers on Friday released a U.S. missionary one day after seizing him at gunpoint outside Haiti's capital and demanding a $300,000 ransom, police said. Philip Snyder, 48, was freed along with a boy after a small sum of money was paid, Michael Lucius, head of Haiti's judicial police, told Reuters. He did not provide any detail about the child or Snyder's condition. "Mr. Snyder was released together with a young boy. That's what I can say for now," Lucius said by telephone. It was unclear who had paid the ransom for Snyder, a representative of Glow Ministries International based in Zeeland, Michigan. Lucius said it was less than the $300,000 sought. 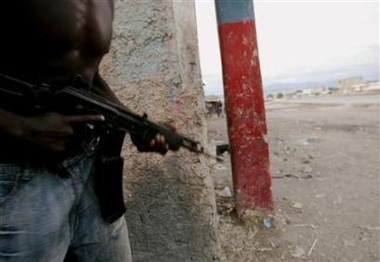 The Caribbean nation has been afflicted by a rash of kidnappings in recent month despite the deployment of more than 7,000 Brazilian-led U.N. peacekeepers following the ouster of former President Jean-Bertrand Aristide in February 2004. Hundreds of people have been killed in political violence as the country lurches toward its first elections since Aristide fled into exile in Africa, facing an armed revolt and U.S. and French pressure to quit. Originally set for November, the first round of the presidential election is now scheduled for January 8. Snyder was kidnapped on the same day gunmen commandeered a school bus and abducted 11 schoolchildren. The children were taken to a hide-out believed to be in the sprawling Port-au-Prince slum of Cite Soleil, regarded as a stronghold of support for Aristide. They were released unharmed later in the day after a ransom of some $4,000 was paid. Police said they believed one of the children held U.S. citizenship but were unable to confirm the information. PORT-AU-PRINCE, Haiti, Dec.1, 2005 - Gunmen hijacked a school bus carrying 14 children Thursday, and a U.S. missionary was kidnapped while driving outside Haiti's capital, police said. The bus was taking the children to school when several armed men stopped it, boarded it and drove off down a main road going to the west of Port-au-Prince, the capital, Police Commissioner Francois Henry Doussous told The Associated Press. He said they're working to secure the release of the children, but did not provide a motive or any other details. Also Thursday, gunmen shot and kidnapped 44-year-old U.S. missionary Philip Schneider as he was driving on a road north of the capital, Doussous said. Doussous said he spoke with the kidnappers of Schneider by phone and that they are demanding $300,000 for his release. The kidnappers even put Schneider, who works for a group called Glow Ministry, on the phone with the police commander. "I just talked to him on the phone. A bullet fractured his arm but he says he is fine," said Doussous, who heads Haiti's anti-kidnapping unit. Doussous said police believe the kidnappers brought Schneider to the Port-au-Prince slum of Cite Soleil, a base for armed gangs blamed for much of the recent violence in the capital. Details on Schneider's group were not immediately available. Police said they did not know his hometown. Haiti, the Western Hemisphere's poorest nation, has a long history of instability. Elections are slated for Jan. 8, to elect a president and parliament. A rebellion ousted President Jean-Bertrand Aristide in February 2004. The former president lives in exile in South Africa. "We do not consider these kidnaps to be politically motivated," said Doussous. "This is purely criminal activity, the gangs need money." Police and the U.N. peacekeeping force in Haiti suspect gangs allegedly close to Aristide of preparing violence to disrupt the national elections.